Want to be on the team? Call 309-853-4431 or email ymca.tumble@kewanee.com. Flip Tops uses rules, routines, & regulations of the governing body for the sports in the USA. Our Mission is to work hard, be positive, have fun, gain friendships, and support the members of our team in making good choices in & out of the gym while improving our talents and skills in the sport. The athlete must be approved by team coach. 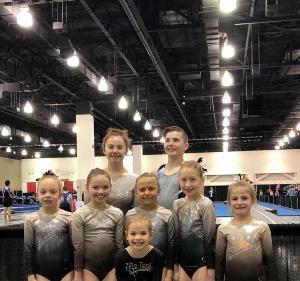 Team members need a Y membership, USAG membership, & competition attire. Team members must also be enrolled and current on session class fees. Meets carry an additional fee and are optional, we attend about 2 per month December-July across IL, MI, IA, IN, and WI. Team class schedule remains the same Fall– Spring, team members are responsible to keep class fees current with session. July 2019 : Palm Beach Florida! Want to be on team? Call 309-853-4431 or email krakenkoach@gmail.com. 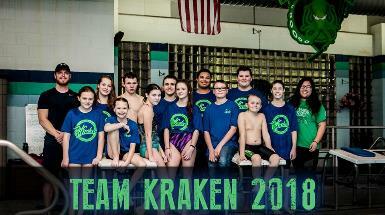 The team is open to any Y member ages 6-21 years of age, capable of swimming one full lap, front and back crawl. If not a current Y member, scholarships are available! USA Swimming Membership is optional, but STRONGLY recommended. USA Swimming meets do count toward YMCA qualifying times! Coached by Scott Packee and Heidi McKibbon. Must be current, yearlong YMCA member PER YUSA swimming rules: Swimming Eligibility. No prorates available. 9/17/18-3/21/19 - $230 paid in full at time of registration. **sibling discount: first child at full rate, additional $10 off each additional child. 9/17/18-12/20/18 - $125 paid in full at time of registration. **sibling discount: first child at full rate, additional $10 off each additional child. 12/17/18-3/21/19 - $123 paid in full at time of registration. **sibling discount: first child at full rate, additional $10 off each additional child. $40/month for 6 months, first payment must be made by 9/29/18. 2 day a week rate also available.